Our staff is comprised of the best professionals in each area of specialty and utilize the latest technology, to better serve our residents and families. These professionals not only administer the care and programming but carry it out in a personal caring, kind, and compassionate manor. Have peace of mind knowing your loved one is being cared for by a staff member they are familiar with and never an outside agency. We truly are a family and this is one way that we live our motto. “We are Family Serving Families”. 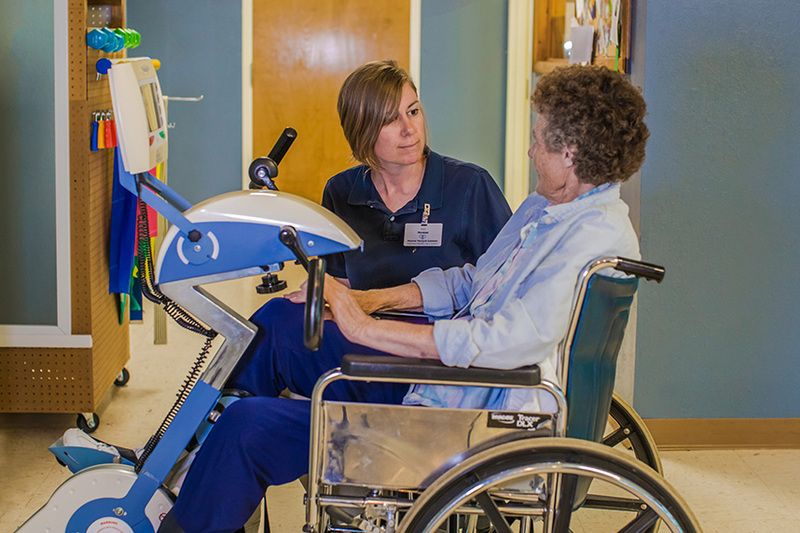 Our objective in rehabilitation is to return each resident to his or her highest practicable functioning level. This often means a return to the community and/or a greater ability to function independently. Below is a list of many services provided by our licensed physical, occupational and speech therapists. In addition, we offer services using our state of the art therapeutic equipment to accelerate their recovery and their return home. Our physical therapy programs include treatment for Neurological, Orthopedic and Rheumatological conditions, as well as other injuries and illnesses that respond to skilled therapy. We have therapists who are specially trained in wound care, balance disorders, pain management, urinary incontinence, and various advanced modalities. Our occupational therapy programs focus on improving residents’ ability to manage everyday living skills. Individualized programs maximize residents’ ability to re- learn basic living skills such as eating, dressing, bathing, cooking, toileting and improve their functional mobility for optimum independence. Our Speech Pathologists assist patients in overcoming problems with speech, hearing, comprehension, expression and swallowing. They evaluate, plan and conduct treatment for all speech deficits, voice problems and cognitive impairments. Our omnicycle: a computerized bicycle for the arms and legs which provide various resistance in the modes of cardiac, neuro and ortho to enhance recovery. The computer screen records muscle out-put percentages between the left and right side and a full digital report of the workout. Our standing box: Used for our lower level patients to promote upright posture and weight bearing while engaging in upper body or cognitive activities all the way to our Victory garden, for our higher level “green thumbs” who have a passion for horticulture and growing flowers and vegetables. Highland Healthcare offers the individualized treatment plan unique to your loved one. Our Wii gaming system: This popular gaming system sweeping the nation is displayed on a 42 inch screen to work on balance, range of motion, cognition, sequencing and eye/hand control. Residents can enjoy a relaxing game of billards or fishing or a competitive match of tennis or bowling. Who says rehab isn’t fun? Advanced Modalities Program: Modalities are any devices or equipment used to facilitate therapeutic outcomes. Traditional treatments, such as hot packs, only heat up tissue down to a fraction of an inch for a short duration. In contrast, our ultrasound and diathermy machines can be used to heat tissue to a depth as much as 3 centimeters or 1-1/4 inches with a much longer lasting effect. Highland Health Care Center is proud to have a rehabilitation program with a pulmonary emphasis. With over 30 million people suffering from pulmonary disease this program is highly valuable. This program combines therapeutic exercise and functional activities with education and specific diagnostic tests. Contact us today to find out more about what Highland Health Care Center can do for you! Highland Health Care Center provides both short-term rehabilitation and long-term care at the highest standards. We provide comprehensive skilled nursing care using state-of-the-art medical equipment and progressive treatment plans promoting quality care. An interdisciplinary care team made up of nursing staff, therapist(s), resident dietician, activities and social services develop a customized plan of care that addresses specific care needs and therapy goals necessary for the resident. Nursing care is provided 24 hours a day, 7 days a week. We offer Physical, Occupational and Speech therapy as well as a respiratory specialty program. Pharmacy, Radiology, Laboratory, Podiatry, Optometry, Dental, Medical, Psychiatry, Wound Management and Hospice services are provided on site, but we do also have transportation available if needed.